Changing company name is as much upheaval as moving house! The whole process of rebranding was deeply involved – we had to dig deep to figure out exactly the right name and image to communicate our offering and how we add value to our clients. But, of course, it was just the first step. Once we had pinned down the new name with our brand development consultants, The Rare Skills Set, we had to choose the logo that best conveyed our values and our outputs and then work with our graphic designer to finesse it. And then we had the mammoth task of working with Larrytech to create a website that communicates our values as well as our services. But the final stage of this big move is to let the world know that we now have new email addresses. 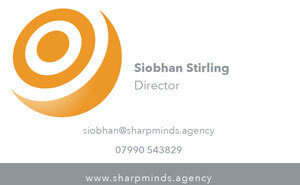 Our director’s email address is on the business card, so please update Siobhan’s contact details, as she’d love to stay in touch with you!